(CNN) - An Iranian judge has sentenced an American Christian pastor to eight years in prison after he was tried for his religious beliefs, a U.S.-based religious group said Sunday. Saeed Abedini was swiftly sentenced by a member of the Islamic Republic's Revolutionary Court, according to the American Center for Law and Justice, an organization founded by television evangelist Pat Robertson. CNN was not immediately able to confirm what went on in the court proceedings. Abedini, who was born in Iran and now lives in Idaho, has been jailed in Iran since September, the group said. "This is a real travesty - a mockery of justice," said Jordan Sekulow, executive director of the ACLJ, in a statement. "From the very beginning, Iranian authorities have lied about all aspects of this case, even releasing rumors of his expected release." "Iran has not only abused its own laws, it has trampled on the fundamentals of human rights," added Sekulow, who represents Abedini's wife and children, who are in the U.S. "We call on the citizens of the world to rise up in protest. 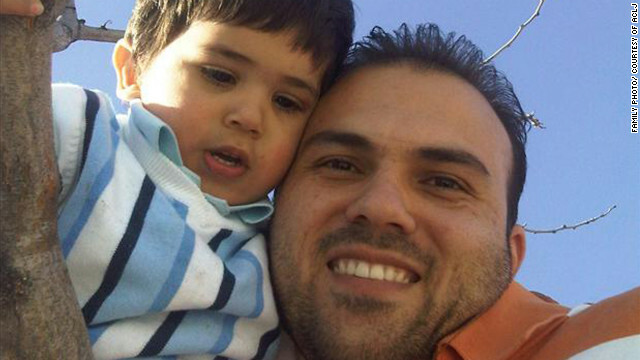 We call on governments around the world to stand and defend Pastor Saeed." Abedini's trial began Monday when he and his attorney appeared in a Revolutionary Guard Court to address charges of attempting to undermine the Iranian government, the center said. His attorney apparently was shut out of some proceedings. "We condemn Iran's continued violation of the universal right of freedom of religion and we call on the Iranian authorities to respect Mr. Abedini's human rights and release him," U.S. State Department spokesman Darby Holladay said in written statement. The group contends that charges stem from Abedini's conversion to Christianity from Islam 13 years ago and his activities with home churches in Iran. On Monday, the pastor gave the judge a written statement and was questioned by prosecutors and his defense lawyer, whom he met for the first time that day. Naghmeh Abedini, the pastor's wife, said last week that a few laymen with the Christian church in Iran told her husband's attorney that they had been called to testify in the case. She said that when she last spoke with her husband on January 9, he was resigned to a fate of remaining in prison. The Iranian state-run news agency ISNA reported Monday that the pastor would soon be released on bail - which Naghmeh Abedini charged Tuesday was "clearly a lie." Saeed Abedini has been arrested nearly 10 times in the past by the Iranian authorities, his wife said. The last time he had been held was in 2009, when he agreed to stop supporting home churches. He has taken nine trips to Iran, where he was born and where his parents live, since then. His wife said he felt that it was safe to go back repeatedly because he had had no dealings with the authorities since he promised to stop working with Christian home services. Once he even went with his wife and two children. He and Naghmeh are both converts to Christianity from Islam, and they received threats during the most recent family visit, so she took the children home. He returned to their home in Boise, Idaho, later. Last summer, the pastor was on a bus that was crossing from Turkey into Iran. Immigration officials took away his passport and he was later put under house arrest. In September he was jailed, in the notorious Evin prison, while he awaited trial. When I observed him traveling at Martinsville, I noticed the motor vehicle experienced a little something to undertake with it at that specific observe, Johnson said Sunday right after jogging 3rd at the rear of Kenseth and Kasey Kahne during the STP 400. Some are critcising the Jesus Christ the same the jewish has done in His time & they are paying the price for the same even today. So humbly request my bothers and sisters not to criticize Jesus our Lord and savior and get punished by God in earth or in the final Judgement. There is no other God in the world who died for our sin and raised from the death and he is still living, I know He is living because I have spoke to him even today. Believe in Jesus Christ so that you & your family can be saved. Is everything you have been taught about Christianity fact or has there been a lot of fiction presented as Biblical truth? Here are some doctrinal positions, are they fact or fiction? 1. The New Covenant was in force during the three year ministry of Jesus. Fact or Fiction? That would be fiction. Hebrews 9:16-17 where a covenant is, there must of necessity be the death of the one who made it. 17 For a covenant is valid only when men are dead, for it is never in force while the one who made it lives. The New Covenant was not in force while Jesus was alive. 2. The apostle Peter used the keys to the kingdom heaven (the keys to enter the church of Christ) before the Day of Pentecost. Fact or Fiction? That would be fiction. Luke 24:47 and that repentance for forgiveness of sins would be proclaimed in His name to all nations beginning from Jerusalem. The apostle Peter first used the keys to enter the Lord's church, at Jerusalem, on the Day of Pentecost. Three thousand entered the kingdom of God on earth. The kingdom of God on earth is the church of the Lord Jesus Christ. The three thousand who were saved and added to the church of Christ on the Day of Pentecost believed that God raised Jesus from the dead and that Jesus was was both Lord and Christ. They repented and were immersed in water so they could have their sins forgiven and then they received the gift of the Holy Spirit. (Acts 2:22-41) They were saved under the New Covenant terms of pardon. 3. The thief on the cross was saved from the punishment of his sins. Fact or Fiction? That would be a fact. 4. Men today can be saved just like the thief on the cross. Fact or Fiction? That would be fiction. The thief was not saved under the New Testament terms of pardon. 5. Moses, Elijah, Job, Enoch, Abraham and Noah were all men of faith and saved . Fact or Fiction? That would be a fact. 6. Men living today can be saved just like Moses, Elijah, Job, Abraham, and Noah. Fact or Fiction? That would be fiction. These men lived and died before the New covenant was in effect. 7. Jesus did not say baptism was essential in order to be saved. Fact or Fiction? That would fiction. It's all clandestine fun and games till the propheting begins to hurt. Looks like God needs the US government to bail him out- again. While I disagree with ANYONE being arrested and not given Const.itutional protection, overstating the case does nothing for your argument. "On May 16, 2012, in response to a lawsuit filed by journalist Chris Hedges, Noam Chomsky, Naomi Wolf and others, United States District Judge Katherine B. Forrest ruled the indefinite detention section of the law (1021) likely violates the 1st and 5th Amendments and issued a preliminary injunction preventing the US government from enforcing it"
Any new news on Pastor Seed? You will have to check on Fox News. There is a hearing before Congress today but you won't hear a word about it on CNN. I WONDER WHAT THE UPDATE IS FOR PASTOR SAEED? Justice has not been done because he did not break any of their laws other than to be a different Religion than Iran. And even that law he did not break because he made an agreement with the government (Iran)to be able to visit his family in Iran and build a Children`s Home there.Please read all of the articles and you will also find out that he(Pastor Saeed) were not even allow to be at his own Trial to defend himself and that witnesses for the government were intimidated not to attend for fear of reprises. How can there be justice if you can not receive a fair trial? This is not just about Religion but about right and wrong. No, it is about law. And their laws differ from ours. justice needs to be done for pastor saeed. Justice is being done, isn't it? The pastor broke their laws, he had a trial, he's serving his sentence. Now if you think their laws are kooky, that's another matter. So go over there and fight within their system to change it. Good luck to you. Iranian muslim laws are obviously diffrent from Christian laws because it is realated to quaran lucifer hell and not connected to BIBLE JESUS CHRIST HEAVEN. JEHOVAH GOD says live by the HIS LAW, or disobey and perish by HIS LAW. JESUS SAVES THOSE WHO LIVE THEIR FAITH. Then I guess we in the U.S. are condemned because we live by human law and at least 6 out of 10 the the Commandments are unconsti.tutional and will never be part of our law. Thank goodness for the Consti.tution and the Supreme Court because its also what we were doing. On May 16, 2012, in response to a lawsuit filed by journalist Chris Hedges, Noam Chomsky, Naomi Wolf and others, United States District Judge Katherine B. Forrest ruled the indefinite detention section of the law (1021) likely violates the 1st and 5th Amendments and issued a preliminary injunction preventing the US government from enforcing it. "In a hole in the ground there lived a hobbit. Not a nasty, dirty wet hole, filled with the ends of earth worms and an oozy smell, nor yet a dry, bare, sandy hole, with nothing to sit down on or to eat; it was a hobbit hole, and that means comfort." In response to Bob, it's one thing to disagree with someone but another to completely make a mockery of their faith. It's not about Bible quotes or shoving Christianity in your face, it's about finding strength in your ideology/religion, however you identify. These quotes were placed so strength could be found, Pastor Saeed and his family need this strength. I'm personally Christian and I don't believe God wants me to tell you, "you are wrong." I do not agree with you but I will neither ridicule nor punish you for your beliefs, so please do the same. I'm with Bob. Round and round we go quoting the Koran, quoting the Bible, quoting the Vedas- you religious nut jobs are the cause of almost every societal malady. Just go away. You are upset with Bob for ridiculing Christianity? Mostly he just quoted the Bible and asked anyone if they really think it represents what they believe. So yes, he questioned the morality of the Christian God and I see little beyond "stop it, that's mean" to answer the charge of immorality. Perhaps more Christians need to stand up to their brethren and get them to stop trying to shove their beliefs down other people's throats and then fewer people will call them hypocrites when they complain about other religious people doing the exact same thing. The Father can love the world without getting dirty.. The bride can't......"1Jo 2:15	Love not the world, neither the things [that are] in the world. If any man love the world, the love of the Father is not in him." Pastor Saeed did not receive a fair trial. athiests were dropped off by alien space ships when their family tree paper ended, with a rock that told them that God doesnt exist because the earth is too old. ahahahahahahahahahhaha. Did your tub of crazy pills finally run dry? Wow, this just re-affirms why I reject all things religious.....just wow. It's all a big misunderstanding. Iran's gubmint passed the law without reading it and the people are stuck with it. .